In the Thracian religio-cultural paradigm, there was no conception of "supremacy". This means that, in a way that sets these traditions apart from many other Indo-European derived religious approaches; there was no "God of Gods" in the Thracian pantheon(s). This was true in Thracian policy as well as religion, although these were a people so deeply steeped in the mythic and sacred that no area of their culture was remotely secular. The political figure that the Greeks and Romans would refer to as a Thracian "king" can be perhaps better understood today as a "shaman"; remember that the Thracians, even when they unified under Odryssian rule, were a tribal people whose numbers were unmatched in all of the ancient world, save for those of the Hindus to the East. 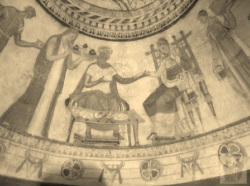 The closest that Thracian culture seems to have had to a "supreme" leader or political role was that of the King-Priest, which fused the functions of king (read: shamanic intermediary and spirit-worker, voice of and servant to the people, especially with regard to spiritual matters) and priest (servant to the gods and spirits). As a predominantly warrior culture, nearly all Thracians -- men and women alike! -- were likewise militant in some way. With no conception of "supremacy", the Thracians also had a far lighter focus on individuality, favoring collective, community-minded tribalisms. These systems of relating communally were defined by roles, responsibilities, and a certain meta-narrative or mythic cycle that was shared in common amongst all Thracian tribes across the huge extent of their territory. Their approach to dealing with deities was similarly divided. It seems that there is more than one Thracian pantheon, and these were geographically specific -- at least at first -- and yet followed the same basic narratives. All Thracian religion, for example, centers around a so-called "Great Mother Goddess", whose role in the divine cycle was the same across the board, but not all of the religions of the Thracian tribes knew the same goddess to fill this role. To some, this space was occupied by Bendis (whom the Greeks syncretized with Artemis and/or Hekate), while to others it was filled by Kottys (whom the Greeks syncretized with Persephone), while others syncretized these goddesses, and others still viewed them interchangeably as mother and daughter. (In some cases, Bendis is the mother; in others, Kottys.) There are likely dozens -- if not hundreds -- of other goddesses who fit these roles as "Great Mother" and "Daughter of the Great Mother", as this was a central element of the Thracian mystery cycle. Amongst the Phrygians, the Great Mother role was enacted by the goddess Kybele, whilst in other areas of Thracian culture, this role of divine matron was awarded to the goddess Hipta. "Thracian religion" as a whole is centered more upon the roles of the gods than the individual characters of the gods themselves. This is a strange statement for many to hear, I am sure, but it is easily understood when the value of social obligation, duty, and role are realized as they were to the Thracians. (For comparison, the "role" of President of the United States of America is more important than whoever happens to be sitting at the Resolute Desk of the Oval Office in D.C.) To the Thracians -- and, based on my experiences with them, their gods as well! -- the roles of the cosmic cycles were more important than any one figure, be they god or mortal. This was in no way a "snipe" on nor "snub" against the immortal and blessed divinities, but instead a refreshing focus on duty over individual indulgence. It is assured, based on the INSANELY expensive and precious devotional offerings left by Thracians for their gods (see "Thracian Treasure", later to be written on this site), that the Thracians loved and were wholly devoted to each of their individual gods in a deep and intimate fashion. The gods and goddesses of Thrace, in turn, seemed similarly devoted to Their people! It is important to note here that the Thracians were, to use a modern term, "hard polytheists"; they did not synonymize deities just because of a shared role, but they DID associate, syncretize, and relate Them to one another in order to establish better understandings of relative positions in the mythic cycle. The religion of the Thracians is a religion that accepts death freely -- even in some cases valuing it above life -- and also encourages its adherents to live their life to the fullest. This idea is perhaps most famous and iconically captured in the image of the Thracian Horseman -- frequently described as Sabazios Himself! -- of which there are hundreds (if not thousands) of historic examples in statuary, reliefs, devotional altars and more. The Greeks called this figure "Hero", who is described (identically to Sabazios) as the son and lover of the "Great Mother Goddess", as a solar figure and also the ruler of the underworld (or at least the funerary guide and guardian for the departed souls making their way to the immortal halls that awaited!) To this day, Bulgarians make pilgrimage to the various sanctuaries of the Thracian Horseman. While Orphism as we conceive of it today is a largely Greek system of initiatory religion, it has it roots -- as does the king-priest Orpheus! -- in northern Thrace. Fol makes a distinction between "Greek Orphism", being the religion that the Greeks wrote down in text, inspired by the oral traditions of Thrace, and "Thracian Orphism" itself, which was never transcribed in any form. There is confusion, and even argument, about the true nature of the Thracian Orpheus, and whether this was indeed a man, or a god, or instead a role passed between multiple characters. Some theorize, and perhaps rightly so, that Orpheus is one and the same with another Thracian god-and-prophet, Zalmoxis, to whom Sabazios is directly syncretized at various points. Others claim, based on obscure references and inscriptions, that the Thracian religions were set forward by a mythic group of seven priests, counted among whom were both Orpheus and Zalmoxis. (These same seven priests are spoken of in the three-volume set Corpus Cultus Iovis Sabazii as possible founding priests and prophets of the god Sabazios himself, based on inscriptions found in the tomb of a known high-priest of Sabazios in Roman times.) All of that said, it is known that much of what we think of as being the early pre-Olympian religious ideas of the Greeks were, in fact, Thracian: the Titanes, the Gigantes, and indeed the Orphic Protogenoi themselves are linked in various ways back to Thrace.